Life Is Too Short to Stake Your Orchid With a Simple Wooden Stick! The following guest post is an interview with Christi Lavoy, owner of BotaniStix®. She is a very creative and talented individual and I highly recommend you check out her site BotaniStix® to see all of her unique designs. Ryan: How did the idea for BotaniStix® come about? How did you come up with the name BotaniStix® and how long have you been in business? 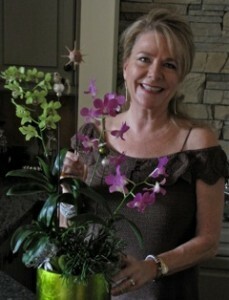 Christi: I had been growing orchids for many years in New Jersey which is nothing like growing them in Florida! When we began spending more time in Florida, I would tell my friends up North that “my orchids were having orchids!” Here they just seem to multiply and not always from my green thumb. When I was surrounded by all of these beautiful plants in my house, all I could see was the ugly, wet, wooden. sticks. In my Google search in 2008, there were no high quality, elegant sticks available for me to buy. So, with the desire to make my orchids more special, I set out to find unusual shells, interesting findings and after much trial and error, BotaniStix® was born. The name came about because my daughter in law, Debra, was doing my 1st website. I envisioned some ‘ideal words’ relating to orchids/plants and botanical was among them. The word ‘sticks’ in some form, needed to be there as well. When this available name Botanistix popped out of a search, I said to Debra yes, that’s it. Botanical stick-that is what holds up any plant that needs staking. People have trouble pronouncing it. So at shows, I always have a sign showing the phonetic pronunciation of the word, bo*tan*i*stix. Ryan: Are you the artist behind each creation? Are they made by hand? Christi: I handcraft each piece in my home studio. Shells started out being in huge demand but slowly, clients wanted to take their BotaniStix® up North and I devised many other designs. I attend jewelry & gift shows & pay close attention to home decor color trends. Orchids and plants are the live accessories that compliment any home. BotaniStix® always needs to be current. For example, the spike trend that has been so popular in fashion accessories, is also available in a BotaniStix® stake as well. My client requests are always researched by me and usually I can come up with a design they love that works in a home setting. At the holidays, BotaniStix® are perfect for Amaryllis or Poinsettias which need staking. I try to keep in mind the many ways people can show their personal style with BotaniStix®. Ryan: How do you come up with ideas for the designs? Christi: Each Summer, after I have attended the shows, I come up with 3-4 new designs. It’s not unusual for a client to have 15 to 20+ BotaniStix® in their home in their multiple plants. If I do not have something new to entice them, they are disappointed. Most recently, I have introduced glass pieces and the sparkle I add to the glass is also macerated glass-not glitter. It’s a more reflective sparkle. 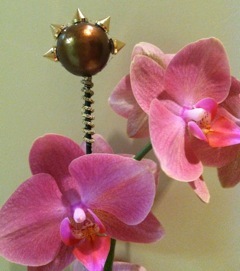 We have added sparkle to our cell phones, eye glasses, handbags, & shoes, why not our plants accessorizing our homes? So many of my clients have become friends because of our similar interests. It’s not unusual for them to ask me to customize something for them. This Spring, by request, I did a line of kitchen inspired mini BotaniStix®. My friend wanted to put them in her potted plants which she had nestled together in an area on her kitchen island. I thought it was a great idea. I used cupcakes, cheese wedges…I also added ‘girlfriend’ themed BotaniStix® by request which were handbags, shoes & martini glasses. Inspiration is everywhere. Ryan: In addition to your website, where else are BotaniStix® sold? Any retailers our readers can stop by to shop at? Christi: On the website homepage is a listing of the 3 retailers carrying BotaniStix® in the SW Florida area and the 2 Botanical garden locations. Ryan: What’s your favorite orchid and why? Christi: I could not choose just one favorite orchid. 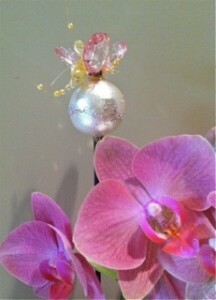 I have many clients that only decorate their homes with white orchids. I couldn’t imagine limiting myself to only one color or type of orchid. My most unusual orchid is shown in the photo (see right). It’s a Gramm scriptum and the color is leopard. It’s gotten quite large in 2 years and is a great topic of conversation when its in bloom each Spring. Ryan: What’s one orchid tip you’ve picked up along the way that you can share with our readers? 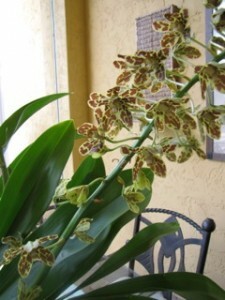 Christi: The tip I have picked up after many years of loving orchids is don’t be afraid of them. Get your hands in there and repot them and learn about what makes them healthy and what hurts their growth as well. It’s so easy to see why a plant is healthy when you look at the orchids roots. They are robust and healthy. Possibly, it’s like a dentist might find the key to our health in our mouth. Ryan: Anything else you want to share? Christi: Since 2008 BotaniStix® has grown solidly. Each stake is now branded with the BotaniStix® logo. Also the BotaniStix® name has been trademarked and registered as of 2013. 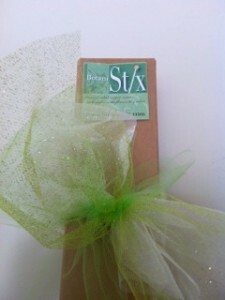 BotaniStix® are a unique gift item for the plant and orchid lover and always arrive in a gift box. So, whether you are trying to find the perfect gift for a friend who has everything or you want to spoil yourself, a BotaniStix® it is! And remember, by signing up to the Green Thumb Club today, you’ll save 15% on everything on Christi’s website. After becoming a member, you’ll get access to a special coupon code (not available to the public) which you can use to get the discount off her site. We hate spam just as much as you.